1. I saw #RunChat a week or so ago and popped my head in. I love how supportive David (@RunningBecause) is, but the fact is that I'm already motivated -- that has rarely waned (except when it comes to diet because pizza is delicious). I've been champing at the bit. Perhaps my running life movie (see below) shouldn't be titled "Out of Gas" but rather "Broken Down Jalopy." I was okay when it was just my back. But now it's gallbladder(?) + back. I feel very overwhelmed by this. I just want (1) a healthy day (without feeling like I need to vomit all the time) and (2) a day without pain (either my gallbladder or my back--which is feeling the effects of the dehydration) (and (3) a day without my ear ringing... but that's not wearing me down so long as I have a kitteh bent on purring in my ear at night). 2. I've been reading Martinus' blog (@300lbsandrunnin) lately and really identifying with what he's been going through. Life is hard sometimes. It's messy. It's ugly. And always having to start over is excruciating because it's not like starting with a clean slate at the start line, or as I said to Martinus, "I see it like wanting to climb a mountain but first having to dig your way out of a cavern with your bare hands." You exhaust yourself even before even getting to the point where you feel like you can once again take up fight. I feel like I'm underwater and unable to get my head above the surface. Is it depression? Maybe? I guess? I feel very much like I'm never going to get to a place where my body and mind are in the same place. It's frustrating. I'm angry. I'm in mourning. And I'm also terrified. I don't know the way forward. I was thinking about the tweets above when I remembered my swim lessons as a kid. They taught me the survival float -- face down floating for when you're in open/rough water (floating on your back only works in calm water). This strategy conserves energy for when you need to use it. 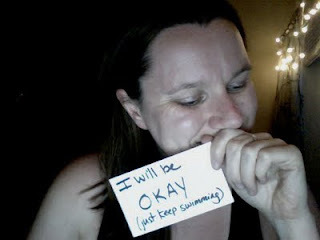 Perhaps I need to remember that I'm using my energy to handle the waves and that pretty soon I'll be in calmer water.